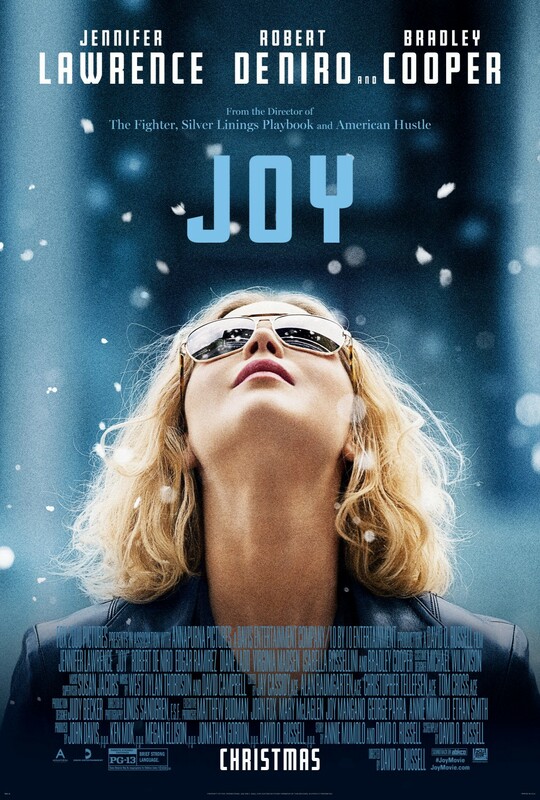 Chrichton's World: Review Joy (2015): Joy what Joy? Review Joy (2015): Joy what Joy? The opening scene had me believe I was watching a It's a Wonderful Life type of story. One that I would have embraced a whole lot more than the mess we got served. Because I don't what they were thinking but Joy is very poorly executed. Joy set up characters and things quite nicely and while chaotic you got to know the dynamics between the characters in a funny way. Six minutes later director David O. Russel (Silver Linings Playbook, American Hustle) undermines himself by letting go of everything comedy and focuses on drama in the worst way. Had I not known this film was semi biographical I would have had real trouble taking this film seriously. Semi biographical you say? Yes, apparently this is based on Joy Mangano, a self-made millionaire who created her own business empire. But even knowing this it makes it quite tasking to get yourself connected to the character and how events play out. Premise wise it's a story I love. An underdog who comes on top and then some. It's something I myself can't get tired of. And yet I was happy when this film was finished. Did it really had to be this tedious and excruciatingly poor? Not even Jennifer Lawrence could convince me. She usually is able to make her character more compelling. Here she fails miserably as I though she did not show what made Joy Mangano so strong. Joy skips on a lot of important details by telling us instead of showing. If that is done to save time where every scene is just as strong as the other I would have understood. But in a film that is too long and weak it's a carnal sin. Am I not supposed to root for Joy? Shouldn't it then be essential to show us why she is so exemplary? Look I don't mind melodrama in the right context. But in this film it was all over the place. It was used whenever and it made it a very weird and confusing affair. What was David O. Russel going for? What is the story he is trying to tell us? If I had to guess I think he was trying to be clever like he tried and failed to do in his previous films. Please stop it. Just stop David! You don't have what it takes. You lack vision and haven't gotten a clue what makes people tick. Why not give us more of Joy's mother or grandmother? I was curious about how the mother was so uninvolved with her daughter. And how her grandmother stepped up. Both Virginia Madsen and Dianne Ladd are used sparingly but do so much in the little screen time they are given. To me it's criminal not to make the most out of the actors you have at your disposal. Bradley Cooper and Robert De Niro appear and hardly make an impression. They are very pivotal story wise but somehow their roles have been trivialized by the way they have been directed. Why not focus on the Joy's father a little more? Here is a character that supposedly wants the best for his daughter yet is the first to tell her she doesn't know what she is doing and that she should give up. It would have been nice to see more fireworks between him and Joy. Am I to believe that Joy just accepted things as depicted in the movie? As it turns out a lot of what is presented as truth has been changed for dramatic effect and I am not sure if this has been a wise decision. All I felt at the end was happiness that it was finally over. I would say don't waste your precious time with this messy film.